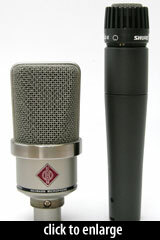 The TLM 102 is a new compact FET condenser microphone, released at the AES show in October, 2009. The mic’s design goals were to provide a high-SPL, large-diaphragm, neutrally-voiced transducer in a very small physical package. The result measures just 52mm x 116mm (2'' by 4.5''). On first sight, the mic’s diminutive size is surprising. It is shorter than an SM57. Due to the mic’s ability to handle 144dB, Neumann positions the mic as suitable for loud sources such as percussion and amplifiers. The mic’s uncolored response and presence boost at 6kHz makes it suitable for broadcast use as well. The capsule in the TLM 102 is a new design. Further details are forthcoming. The mic ships with a metal ring mount, and is available in black or nickel finishes. We note some obvious similarities with the Gefell M930, which is also a high-SPL, transformerless, FET condenser with a shockmounted large-diaphragm cardioid capsule in a small (and similarly-shaped) case. 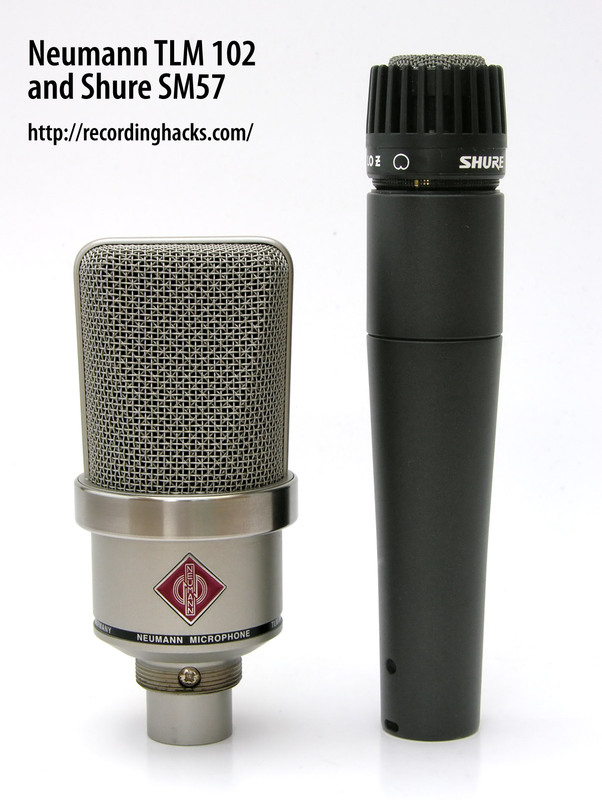 In fact, the frequency-response graphs of the two mics are nearly identical. The M930 beats the TLM 102 in its self-noise rating (6 dBA vs. 12dBA) and sensitivity (23 mV/Pa vs. 11 mV/Pa), albeit at a street price that is 70% higher. The TLM 102 received a TEC award in 2010. [T]he Neumann [TLM102] excelled on close-miked electric guitar amp, yielding an exemplary in-your-face sound. In addition, we liked the 102’s low-end response when miking electric bass amps. [Oakland, CA engineer Bart] Thurber also tried the [TLM 102] pair as drum overheads, but he noted that it picked up too much room sound and not enough cymbal definition for his tastes. Aimed at where the neck meets the body on a Martin D-15, the TLM 102 sounded gorgeous, providing a full, natural sound with a present top end that was not hyped or etched. The TLM 102 [is] sensitive to wind or structure-borne noise… [T]he mic easily picked up foot-tapping sounds through the mic stand. (Using a shock-mount alleviated this issue.) The extended response can also exaggerate the TLM 102’s proximity effect: Place the mic near the sound hole, and the result can be very boomy. Unfortunately, the TLM 102 doesn’t offer it, but a highpass filter should be considered mandatory, either at the preamp or in the DAW. The Neumann TLM 102 is also known as: TLM102.